A healthy but often painful documentary, the first part of "The Mormons" that aired tonight, April 30, on PBS focused on what outsiders are likely to consider the hottest historical issues, polygamy and the Mountain Meadows Massacre. (No, they didn't get to blacks and the priesthood or the challenge of homosexuality - we'll probably get lengthy segments on those topics tomorrow.) The very lengthy section on polygamy was almost tedious, as if this modern world religion is largely defined by a practice that the Church abandoned over a century ago. For Latter-day Saints, it will be easy to view the program as biased and even somewhat hostile. It certainly isn't the kind of thing that is going to make people want to run out and start investigating the Church, but I hope it will lead to a lot of healthy discussions and increased awareness, though perhaps not of the "right things." I thought Professor Terryl Givens was outstanding, and enjoyed the way he spoke of our religion. And I really enjoyed listening to Ken Ken Verdoia of KUED. Ditto for many of the other speakers, though a couple had an axe to grind at times and stated opinions and speculations as conclusions. I objected to the dark, eerie piano music in the background during the discussion of the origins of Mormonism and some of the distorted, almost frightening paintings they found somewhere (what's wrong with the numerous paintings of the Angel Moroni that don't look like a drug-induced nightmare?). Keep the same narration in that portion but change a couple of the paintings to more cheerful works, replace the dark music with Mozart, and bingo, we'd have something almost suitable for seminary. I think the program will be most helpful to Latter-day Saints, reminding us about the pain of polygamy, the trauma of Mountain Meadows, and the difficulty of resolving poorly documented events of LDS history when much remains unclear and subject to wildly different interpretations. My two younger sons watched it with my wife and me, and I'm glad they saw it. Inoculation, perhaps? It gave us a chance to talk about some troubling aspects of our past, including a lesson from the Massacre: even wonderful bishops and other leaders are fallible mortals, and there are times when we may need to challenge what they ask us to do. Overall, in spite of what I see as an almost sensationalistic emphasis on some painful aspects of our past, I believe the producers did strive to be fair (at least fair in appearance). I look forward to learning about more of our flaws tomorrow, and perhaps some more of what our faith is really about. I do wish they had allowed at least portions of the First Vision to be told in Joseph's words and more of our story as we know it to be shared. So much of the essence of Mormonism was left out, while the microscope zoomed in on Mountain Meadows. Some of the finest scholarship and commentary on the life and teachings of Christ is found in Alfred Edersheim's marvelous work, The Life and Times of Jesus the Messiah. Edersheim was an educated Jew raised in Vienna who became converted to Christianity. His knowledge of Jewish lore and Rabbinical teachings allowed him to provide numerous insights into the New Testament that will enlighten and fascinate its students. And since the work was published in 1883 (the copyright has expired), it can be made available on the Internet at no cost. In today's Gospel Doctrine class on John 7 and 8, I used portions of Book IV from Edersheim, specifically Chapter 4, Chapter 6, Chapter 7, and Chapter 8. Understanding what happened at the Feast of the Tabernacles allows us to visualize the dramatic impact of Christ proclaiming that He was the source of living waters moments after the power ceremony of pouring the waters of Siloam at the sacrificial altar, symbolic of the pouring of the spirit upon the House of Israel. It also brings new understanding to the drama of Christ declaring that He is the Light of the World, as the gigantic menorahs around the Temple were lit during the festival. Jessica Smith of PBS's Frontline kindly sent me the following message to share with Mormanity readers regarding their broadcast of "The Mormons" on April 30 and May 1. I hope you'll all watch it! Here's hoping "Mormanity" readers might appreciate the following reminder about the upcoming FRONTLINE/AMERICAN EXPERIENCE co-production, "The Mormons," airing this Monday (April 30) and Tuesday ( May 1) on PBS, and online at http://www.pbs.org/mormons after the broadcast. * And, the full four-hour program video streamed for viewing online. Please let me know if you have any questions or need anything. Provo Surprise: What's Up with These Drivers?! I was in Provo, Utah today to attend the graduation of my son and his wife from BYU. While walking around Provo a few blocks south of campus, I repeatedly experienced surprising behavior from automobile drivers: they stopped to let me cross, even when I wasn't in a crosswalk. I was really caught off guard the first time this happened. Why is this car stopping? The first time I figured was just a fluke, but it happened several more times in the next few minutes. What's up with these drivers out here? I started to wonder if I was being "love bombed" by some sort of cult to get me to join. Then I realized, hey, I'm already a member - your clever plot won't work with me. But I appreciated the change of pace. It just didn't seem that way when I was a student there about 20 years ago. Was this just a repeated fluke? Fabulous university. I really appreciate the positive changes that have occurred out here over the years. Congrats to all you graduates! This Theology professor at the University of Munich was well known throughout Southern Germany. She stood up in front of this small congregation of people and said, "Before I'm baptized I’d like to tell you of my feelings. In Amos 8:11 it says, there will be a famine in the work of God. I've been in that famine for 76 years. Why do you think I have three PhD's? I've been hungering for the truth and have been unable to find it. Then 8 1/2 weeks ago, two boys walked into my home. I want you to know these boys are very nice and wonderful young men, but they didn't convert me. They couldn't; they don't know enough." And then she smiled and said, "but since the day they walked in my door I have read the Book of Mormon, the Doctrine and Covenants, the Pearl of Great Price, all of Talmage's great writings, Evidence and Reconciliations by John A. Widtsoe and 22 other volumes of Church Doctrine." She then said something which I think is a challenge for everyone of us here. She said, 'I don't think you members know what you have." Then in her quiet, powerful way, she said, "After those years of studying philosophy, I picked up the D & C and read a few little verses that answered some of the greatest questions of Aristotle and Socrates! When I read those verses, I wept for 4 hours." Then she said again, "I don't think you members know what you have. Don't you understand the world is in a famine? Don't you know we are starving for what you have? I am like a starving person being led to a feast. And over these 8 1/2 weeks I have been able to feast in a way I have never known possible." Her powerful message and her challenging question was then ended with her favourite scripture, "For you don't see the truth can make you free." She said, "these missionaries don't just carry membership in the church in their hands, they carry within their hands the power to make the atonement of Jesus Christ full force in my life. Today I'm going into the water and I'm going to make a covenant with Christ for the first time with proper authority. I've wanted to do this all my life." Sometimes we get too focused on controversies, the problems of mortal leaders, the weaknesses of members, and unresolved theological puzzles. It's good to occasionally step back and look at the big picture of the Restoration. How wonderful to have restored the basic truths about God, the covenant framework of the Gospel, authority from God, modern revelation through prophets and apostles, and ordinances such as baptism by immersion. There was an Apostasy, a famine of the word of God, and now there has been a Restoration. Do we know what we have? I'm so ashamed of NBC for giving a mass murderer the soapbox he wanted by playing his insane video clips for all the world to see. How many other psychopaths out there will now feel motivated to make similar videos and get international fame and attention? Will the NBC business model call for a minimum number of dead bodies before they will broadcast the killer's video? There are aspects of the story that deserve much more attention than a lunatic's video. Why not focus more energy on the story of Professor Liviu Librescu? I refer to the 76-year old Jewish professor and Holocaust survivor who sacrificed his own life in blocking the gunman at the door of his classroom, giving precious time to allow the students in his class to escape through windows. What heroism! But his courage didn't suddenly materialize in that moment. There was courage throughout his life (see the Wikipedia entry for Liviu Librescu). Surviving the Holocaust, then later putting his own career at risk in Romania by refusing to swear allegiance to the Communist Party. This man's life is filled with strength and courage, culminating in the ultimate act of selfless bravery. A decent media would be playing clips of his life, digging into his story, rather than rewarding a mass murderer and encouraging others to follow that path to fame. Wouldn't this be a better world if the stories of men like Dr. Librescu were given more attention than the rantings of insane villains? Thank you, Liviu Librescu, for your faith and courage. You were a tremendous credit to your religion and a true hero. May we not forget! Today, with his permission, I am happy to share one of his most recent works, "Letter to My Imaginary Father," which has strong religious overtones. It reminds us that our mortal fathers are rarely our ideal fathers, as we are rarely their ideal children, and hints at higher companionships. In fact, I see it as a surprisingly Christian poem from someone who does not consider himself Christian. For best results, I think it should be read out loud, slowly. Maybe twice. Enjoy. Your face is gentle, your eyes like stars. I never told you this because I always thought you knew. I was always a failure as a son, father, not because I could not live up to your expectations, but because I could never match the love in your eyes, your passion for me as a son, or your face which was like a goblet of grapes, the lines and courses of which became the sad repast of joy, loss and somehow, compassion. You liked to read beneath the low glow, some book by Brodsky or some sweet leathery volume that told the story of some immigrant from some painful and therefore, triumphant, place. I don't know why I had to leave you, why I had to become your prodigal son, and wear the guise of another nation, or the name of another man who bound me and threw me into chains and then orphaned me into a barren wilderness. And still, when finally, I returned home, wretched and broken, you embraced me and smiled. Your eyes lit up like entire constellations and there was a celebration--and a darkness over your brow. And it cleared, as if a great storm had passed silently--like a creepy abandoned ship at sea that passes without dropping anchor-- brooding over a field of desolation, not because it was empty, but because the garden was rich, the grapes were pungent with flavor and ready for harvesting and our lives were covered in this danger always--like water, like war, or rather, the rumors of war. O father with the contours of your weathered hands gripping some object of finality, a book, a plow, a gun--your hands wretched with death's grotesque demands where one of us must bury the other, and you spend your whole life explaining it to me. The fields are harsh, of this there is no doubt, and the books you made me read even though I squirmed, were the myths of another land where fields unfold like dreams and the dark barn illuminates a sky where a storm has just past and not too much damage has occurred. As I said, I always failed you as a son, not your expectations but your dark light and the brooding pre-eminence of all that was to be--which was really what brought me home in the end. Wonderfully, the lives of some viable children may be spared after five of the nine Supreme Court Justices ruled that it's OK to ban the grotesque and absolutely unnecessary slaying of helpless children as they are about to be born. A well-written law, coupled with overwhelming evidence from the medical community that PBA is bad medicine and that it has NEVER been needed for the physical health of the mother made upholding the ban a no brainer for all but the most hardened. The fact that four justices still wanted to discard that law, and that many leading politicians are outraged over the ban, is chilling. The blood of innocents is still poured out upon this land by the tens of thousands. The abortion industry rakes in big bucks, profiting from the immorality of millions. The glimmer of hope around partial birth abortion is still too faint to overcome the darkness. May we stand for life! "No, Really, Just Call Me Jeff"
Something I've said a time or two when someone takes the name of Deity in vain. Sometimes people get it, laugh, and adjust their language. 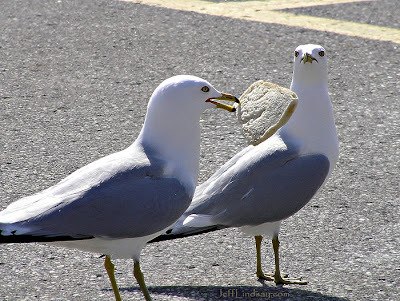 Today I enjoyed watching a a few noisy gulls goals competing for a stiff, stale piece of bread in a parking lot. "Mine . . . mine . . . mine . . . ." We humans are equally monotonous and predictable in our greed for material goods. Sometimes it's so silly, but the results can be so sad. When we trample over others to cling to our precious crumbs, throwing away all that really matters for something stale and worthless, it would be funny if the harm to others weren't so great. Today in our Stake Conference meeting we were pleased to participate in a regional conference in which Elder Thomas S. Monson was the main speaker. How I love that man! I think he is the General Authority who most inspires me. I admire his focus on love, on Christlike compassion, on reaching past our greed and biases and petty needs to consider others and serve. Who can look into the life and teachings of Elder Monson and not see a true Christian seeking to follow Christ? May we be ready to share our crumbs of time, food, and wealth with those around us and follow the teachings of Christ and the inspired teachings of His living servants, the apostles and prophets. It was a truly magical day in Atlanta, when so many exciting things seemed to go right - a fabulous day at work, a marvelous experience with a friend with an atheist upbringing in which I got to share a Book of Mormon and my thoughts about God and Christ, followed by including a marvelous Shabbat dinner with a Jewish family featuring some of the most loving, talented and impressive people I know. This amazing day concluded with a quirky moment in the parking lot at my hotel. I walked away from my rental car -- a sizzling red Mustang, of all things, randomly assigned to me by Hertz -- without having locked it. I realized my mistake and stopped, about 20 feet away, pointing my wireless key fob at the car. As I pushed the "lock" button, I expected the car lights to flash to acknowledge that it had been locked. Instead of a response from my car, at that very a street light directly above my car turned on with a "pop." I hadn't noticed that it was there, off, in spite of the darkness (this was after 10 pm). I took one more step toward the car, clicked the key fob a second time and now got the flash of lights from the car as it locked. Wow, I thought, could this key fob control a street light? Did it have magical powers that extended beyond my uncomfortably flashy car? Chances are that the surprise activation of the street light was entirely a chance event. The street light was about to flash on at that moment, for whatever reason, and I must have been a few feet too far from my car for it to read the signal. It only seemed like there was a cause and effect relationship. At the same time, I believe there are miracles that can look like coincidences, and that we should acknowledge the hand of the Lord in the many ways he blesses us and the many things He does for us. I think it's often helpful to look for confirmation beyond mere coincidence, and to consider the significance of an unusual event from several perspectives. Any thoughts? Well, the key fob thing was definitely just chance, not mystic power. I pressed it a couple more times just now and no more lights went on. So, what I'm trying to say is -- sorry, got to run. I just noticed this incredible meteor shower that I can see from my hotel window. And fireworks just started, too! Cool! A few years ago, a member of the Church in Menasha, Wisconsin died a tragic and painful death when he rushed back into his burning home to look for a couple of his children that he thought were still inside. All the children of the two families living in that home had escaped safely, but some were gathered behind the home and others in front. They had never established a plan for dealing with fire, and thus didn't have an agreed-upon gathering place. The father went into the home with a garden hose. While just a few feet from the front door, a sudden back draft of flame swept around him. It's incredible how dangerous a burning home can be. He was heroic in trying to save his family, but they were already safe. His death still troubles me greatly. I once was the home teacher of that family. We had helped them on a variety of things, but it never occurred to me to check and see if they had a fire safety plan. This could be a great thing for home teachers and visiting teachers to consider, especially for immigrant families that might not have had the basics of fire safety while in school. In addition to providing help with requests from your families, there is a need for friends like home teachers and visiting teachers to be more proactive and inquire about other possible needs in the lives of your family. Have they taken steps to help children recognize the dangers that strangers might pose? Are they getting decent nutrition? Is there dangerous clutter that could lead to a fire or other injuries? Is there car an accident waiting to happen? Do they wear seat belts? Think about physical safety as well as spiritual safety when working with your families. And be sure to help them take steps to live providently, get out of debt, improve their education and employability, etc. Perhaps helping a child with some math homework might be the most important thing you could do for somebody this month. Let's help our families live better and longer and happier lives. And fire safety might be the place to start. The movie reminded me that among the crowds of people that might seem like losers to others, there are royal sons and daughters of God, good people doing all they can to be decent parents, to find their own way, and to overcome their problems. But they are on the edge, sometimes just one paycheck away, one bill away, one buck away from disaster. Sometimes they are past the edge, living in homeless shelters or public transit bathrooms. And this is why I want you to take up gambling. Gambling? Yes, but not on slots or horses, but on people. Bet $5, $10, $20, or more (much more, sometimes), giving some extra cash to those who are down and out. Some are going to waste it. Some are going to lose it. But for some, that gamble you took could turn into a jackpot that could make a huge difference for that day, that week, of even for a life -- the difference, perhaps, between hope and despair. That's what I was thinking during this movie, thinking about the challenges Chris Gardner faced day after day. In his moments of crisis, and in the lives of many I have known, a small amount of cash freely given could have made the difference between disaster and hope. And no, fast offerings are not enough. I've been a bishop, I've administered the inspired and wonderful fast offering program, and I can bear witness that as good as that program is, it is not enough to reach some of the people you are going to be standing next to, some of the people you are going to be inspired to bet on. There are limits to what can be done with fast offerings, strict rules that generally mean a bishop usually can't just walk up to someone in need and hand over some cash on the spot. (When I was bishop, I was so grateful to a couple of my ward members, real gamblers, who came up to me and said, "Bishop, I know you can't do some things you might want to with fast offerings, so here's a handful of anonymous money for you to use off the books for special cases." That was a huge gamble because it was also a gamble on me, but I think tremendous good came from those "under the table" donations.) Fast offerings are a little more like investments, money that comes with rules and often doesn't look foolishly spent. But you can be the fool with your extra cash or other resources. Be sure to give generous fast offerings and support solid charities, but save some gambling money on the side. Sometimes the world needs a crazy gambler who dares to look fate in the eye and throw money not to the wind, but to the Spirit, placing what may be inspired or even prayerful bets on the potential of others. It may seem random and spontaneous or it may be planned, but however you do it, I'm hoping some of you will take up the true gamblin' spirit and place wild bets and have the experience of one day learning that you hit a jackpot or two. Turning back to Chris Gardner and the movie, I'd like to say thank God for the Glide United Methodist Church in San Francisco that gambled away so much money every day on the homeless, betting that it would make a real difference in the lives of some. Their efforts helped sustain Chris Gardner as a homeless man struggling to become a stock broker in a difficult internship. Any of you know the good people at Glide? Give them a high five or a high $20 or something. Way to go, my brothers and sisters at Glide! The reason for this kind of gambling is not just hope of the occasional jackpot. The Christian call, the one taken up by so many inspired organizations helping the homeless and others, is to love and minister regardless of what happens in the lives of the recipients. But for some, a small act of kindness, a few bucks, a meal, a place to sleep, a ride to work, help with a bill, can be a turning point that can change their lives in a lasting way - and that's a jackpot of spiritual wealth that I love to see. In Chris's case, he became a successful business, millionaire, author, speaker, philanthropist, etc., all of which is cool. But most of the success stories that might come from generous gambling will be peace and hope in the lives of people who aren't going to become rich and famous. In the end, all the wealth means nothing, but the hope you give will mean a lot. There are millions of unclaimed jackpots out there, and no two will look the same. Naturally, you can gamble with things besides money. Your time can be generously gambled away in serving the needy and the sick or others in your midst. It will make a difference sometimes, though perhaps not most of the time. Don't worry. The more you play, the more you win. Keep that gambling hope alive! Scott Gordon's short article, "The Eight Witnesses," provides excellent insight into the significance of their testimony. It also deals with the squirrelly allegation from anti-Mormon sources that the Eight Witnesses didn't actually see the plates. Yes, that's actually a commonly repeated argument, believe it or not. It's one of many valuable additions to the FAIRLDS.org Website, one of the best sites in Mormondom. Provident Living: Soon To Be Forced Upon Us? The Church has been trying to teach its members for years the importance of provident living - staying out of debt, spending less that we earn, preparing for cloudy days ahead, etc. So far, millions of Americans have had the luxury of choosing whether they live frugally or not. Soon that luxury may be gone, and provident living will be the only option for many as economic reality catches up with the United States. Are you ready? Are you preparing? First, rising real estate prices allowed Americans to routinely borrow against home equity and repeatedly refinance loans of any stripe (be they mortgage, credit card or automobile) at lower rates. If the home equity was turned into cash, or used to pay off other debts, the result was additional spending beyond what consumers could have afforded based solely on their incomes. Second, adjustable rate mortgages, especially the "negative amortization" or the "interest only" varieties, allowed Americans to enjoy temporarily low mortgage payments despite accumulating bigger mortgages. The difference between those temporarily low rates and the normal rates, to which these loans would ultimately reset, was available to be spent by homeowners. Third, as real estate prices rose, homeowners felt wealthier, which has been shown to be a stimulant to spending. In addition, the pervasive belief that home prices would continue to rise indefinitely led many Americans to make false assumptions regarding their financial circumstances and their need to save to meet future obligations and retirement goals. As a result, money that would have typically been applied to savings was spent. Consumer spending must dry up, and yet as the prices increase due to a weakening US dollar, the Fed will probably not be able to cushion the landing by decreasing interest rates. Rather, to try to keep foreign investors from dumping the US dollar as it weakens, they will have to increase interest rates to compensate. All this could create a crushing economic burden for the US economy. Ladies and gentlemen, it's time to get out of debt now and start saving in ways that will still have value when the dollar tanks. While I try to avoid political topics most of the time on this blog, enough people have asked about Mitt Romney that I feel a need to finally chime in. It's hard to discuss Mitt Romney without considering the "R" word. Now in bringing up his religion as an issue, let me first state that I have nothing against his being Mormon. I really respect Mormons, for the most part, and some of my best friends are Mormon. In fact, I'm Mormon. But can we afford to have the security of this nation and even the world resting in the hands of a man who might have to disappear two or three nights a month to do his home teaching?? And what about all the other callings that some unelected bishop in Washington decides to give him? Unless that bishop is, say, Harry Reid, we would have to face all sorts of security issues. So we may need to start using appointed or elected bishops instead of the Church's current archaic system. Maybe even the People's Official President Elect could be in charge of the appointments to make sure that things go smoothly. My big worry, of course, is that Brother Romney would be asked to serve as Young Men's President, and then we'd have kids playing basketball in the halls of the White House or rappelling from the sides of the Capitol building, giving Homeland Security all sorts of head aches. Is the nation ready for this? Is the world? OK, on a serious note, I have to say I was impressed with his speaking style when I listened to a luncheon speach he gave a couple weeks ago. Very polished and agreeable. I don't think America could go for an LDS President, though, even if the country were more conservative, but I wish him lots of luck and hope he'll be the candidate with the fewest scandals. May we all have fewer scandals in our lives! Recently an anonymous commenter on my post, " The War on Terror and America's Moral Decline," raised my eyebrows with a comment on George Washington. He quoted some source on the Internet about George Washington having written "smutty" letters. His sourced stated that "in the late 1920s, multi-millionaire J. P. Morgan bought some [surviving letters of George and Martha Washington], but he burned them saying they were 'smutty.'" The commenter then said, "aw,apparently, even george washington, the person we could rely on for moral interigdy [sic] liked dirty jokes." While our Founding Fathers had moral flaws, as have all prophets and all humans other than Jesus Christ, I am surprised at the eager gullibility of so many in accepting some of the rumors of moral weakness in great men whose integrity and moral strength transformed this land for good. George Washington in particular was a man of incredible integrity, honor, and virtue that should be celebrated, regardless of some flaws. And certainly we must not dismiss his morality on the basis of silly rumors. The Washingtons destroyed nearly all of the letters between George and Martha. A few authentic letters did survive. See, for example, two letters in the University of Virginia's collection of George Washington's Papers. Nothing unsavory there! Note that footnote 1 indicates that no previous letters (prior to 1775) have been found. I've noticed a number of articles on the Web repeating the story of Washington's smutty letters. So we're supposed to question the morality of George Washington because of the purported content of letters that J.P. Morgan or his son bought and destroyed, letters that no other historian has seen (as far as I know)? We live in an era where the truly noble and virtuous souls of the past are an embarrassment to the lowlifes that seem to dominate the circles of power and influence in our society. They will continue tearing down the character of great people, while dismissing the abominations of their own heroes and icons. As dull as General Conference can be compared to modern entertainment options, the more I pay attention, the more I come away with valuable insights into how to live a better life. A day or two of General Conference strikes me as more valuable than many of the high-paid self-help gurus and motivational speakers out there. Priesthood Session last night touched upon many issues that have been weighing upon. Wise leaders speaking with experience and deep spiritual perspectives can do much to help us reframe our questions and problems. I also was enriched by the focus on Christlike service that we heard about today, and the eternal perspective that was added to many of our problems. I love the stories I hear at Conference as well. The explanation of a young child for his bad deed still has me chuckling: "I'm sorry - I lost my CTR ring and now I can't choose the right." Warnings about spiritual vertigo from Elder Robert D. Hales rang so true, and the dramatic story of a rebellious pilot doing stunts at night and mistaking the lights of an oil field for the stars above him, crashing into the ground due to his disorientation, described so well the chaotic moral misdirections of our day in which the movers and shakers of our society send millions into spiritual death spirals while proclaiming that they bring liberty. Thomas S. Monson's story of a Conference talk that he felt inspired to direct to one young girl in the audience really touched me. She came to conference seeking guidance on whether to be baptized or not, and his inspired focus on her was an answer to her quest. I was thinking, "Yeah, but it's easy for skeptics to dismiss because we haven't been given details . . ." - but there was her picture, and then the follow-up picture of her and her family years later, obviously used with permission (along with her first name), and certainly hundreds of people know her and were also witness to the earlier talk. Any of you know more details? Overall, a wonderful Conference, with lots of rich material that we can look forward to reading in future weeks when the Conference Report comes out.